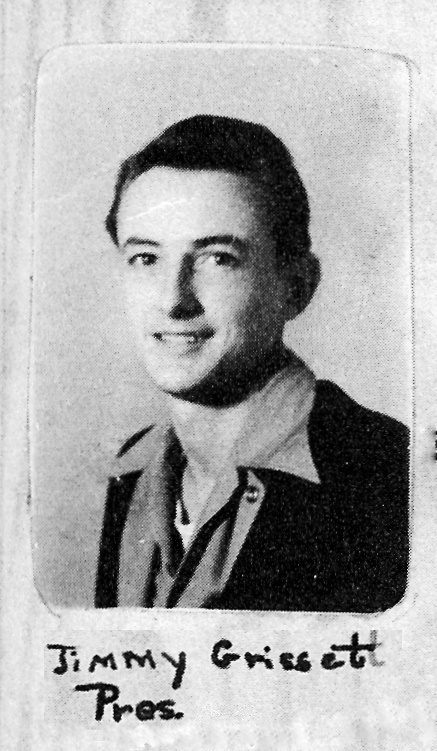 Jimmy Grissett, 1948 Ray City School photo. 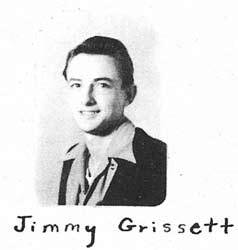 Jimmy Grissett, born December 1, 1932, was one of five children born to James and Lily Crum Grissett. 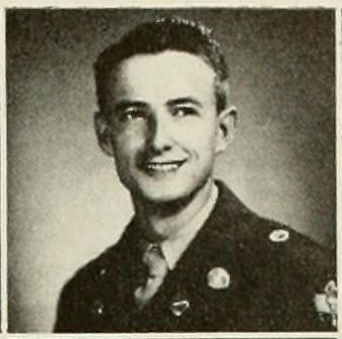 James Grisset, Sr. was a mail carrier serving the Ray City area, and for some time he served as a U.S. Postmaster. The Crum family had an automotive business in Lakeland. Lily Grisset was known throughout the community for her kindness and assistance to those less fortunate. For years, she played the organ at Ray City Baptist Church. The Grissetts owned a large farm at Ray City, GA situated between Beaverdam Creek and Johnson Street. This land also had some frontage on Pauline Street and on Main Street. The house located on Pauline Street across from the Beaverdam Cemetery was owned by the Grissetts, although they never lived there. The house may have been occupied by tennant farmers who rented some of the Grissett land. As young people, Jimmy Grisset, Anna Martha (sister), Diane Miley, Carroll Brown Guthrie, Herman Knight Guthrie, and some of the Knight cousins spent summers working at the tobacco barn on Paul Knight’s farm out on Clabberville Road (aka Johnson Street), southeast of Ray City. At the time this land was being farmed by Herman Guthrie, son-in-law of Paul Knight. 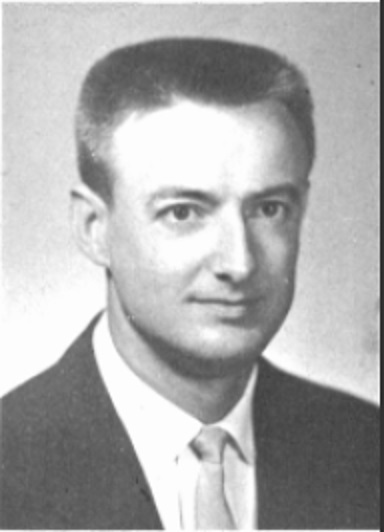 Following graduation from Ray City High School, Jimmy Grissett went on to study at North Georgia College and Georgia Institute of Technology where he received a degree in Mechanical Engineering in 1958. 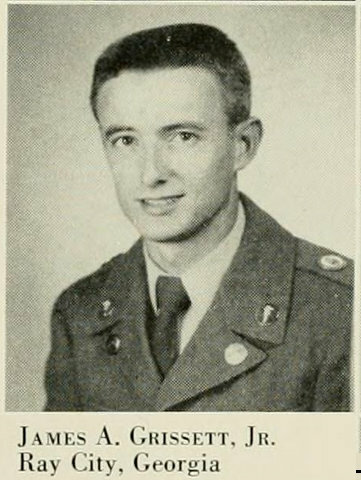 Image: The Cyclops of 1951, Published by the Cadets and Coeds of North Georgia College, Dahlonega, Georgia. On the south side of Ray City, GA there lies an east-west road today known as Johnson Street, but back in the day this byway was known as Clabberville Road. Rozzie Swindle had a farm out this road, and it was their dairy activities from which the name Clabberville arose. The Swindles raised cows, and chickens and livestock of all kinds. They sold eggs, butter, and milk and also clabber, which they produced from the milk. Clabber was similar to yogurt, although when yogurt was first introduced in the U.S. the comparison was made in the other direction. To make clabber, fresh milk was strained through a cheesecloth, into crockery bowls which were then placed in a “safe”, a screen enclosure to keep out the flies. This sweet, unpasteurized milk sat overnight and the next morning the cream was skimmed off the top. Below the cream was the sweet clabber, a semi-congealed yogurt like mass. The cream was churned into butter. The clabber was placed into jars and sold. Effie Knight, of Ray City, GA always used clabber in her biscuit recipe. The Swindle place was known throughout the area as the source for sweet clabber, which in turn became the origin of the name of Clabberville Road. Later, one of the Swindle girls married into the Johnson family, and the road subsequently became known as Johnson Street. “Every one knows that butter is the solid, fatty part of the milk, separated from the fluid portion by churning. But the skim milk, or even the buttermilk, contains a large percentage of white, solid matter, which develops when the milk is permitted to turn to clabber, as a Georgia farmer would call it, but curds, in the language of the cheese-maker. Those who are familiar with clabber, know that if cut in pieces with a spoon, or knife, a large quantity of watery fluid, or whey, separates from the more solid portion. This solid part, when deprived of all the whey, and salted and pressed, is cheese. The aim of the cheese-maker is to cause his milk to “turn,” or become clabber, without undergoing the souring process. Sweet clabber was a popular food in the south; in the north it was thought fit only for pigs. Still, clabber was often popularized for its healthful benefits. With the rise of pasteurization the making of clabber virtually stopped, except on farms that had easy access to unprocessed cow’s milk.